Did you know, every year more than seven million people globally suffer from a Sudden Cardiac Arrest (SCA) with no warning. And, only five to 10% of those affected actually survive. But, with so many different options it understandably can be a daunting process. You need to ensure you have the equipment best suited to your environment and needs. Or, if you'd like to discuss your options and receive some helpful advice you can talk to a member of our expert customer support team today. Simply call us on 0845 604 8280, email sales@aerohealthcare.co.uk or leave your details on the short form below and a member of our team will get back to you shortly. Over 7 million people die each year as a result of a Sudden Cardiac Arrest (SCA). It is often assumed that SCA only affects the elderly or the unwell, but in reality, anyone, anywhere at any time can suffer from an SCA. Tragically, many of these deaths can be prevented. Aero is currently running campaigns to help raise awareness around the use and importance of defibrillators in the chain of survival. 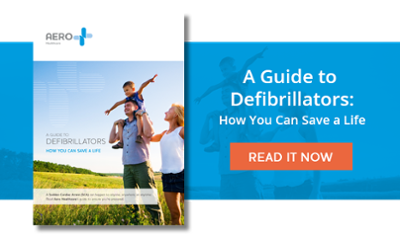 To coincide with our SCA awareness campaign, we've developed the following informative guide: "Defibrillators - how you can save a life." If you are a distributor of our products, there are opportunities for you to use this guide in your marketing not to mention the range of other marketing materials that we can make available to you. Please get in touch to find out more. Together, we can work to better equip individuals with the knowledge they need to save lives.